In my girls group we started talking about self identity and self esteem. 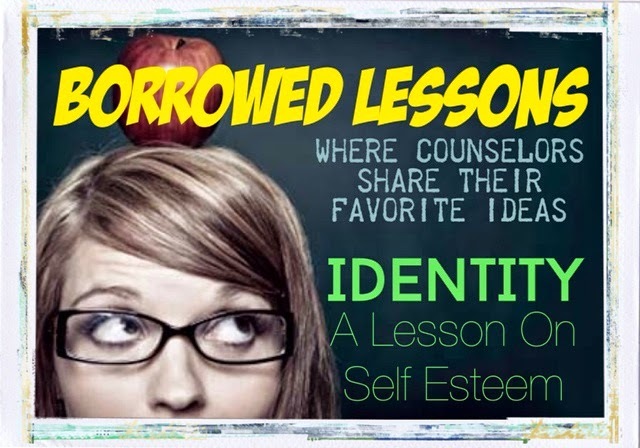 I started off this discussion with an amazing Youtube video called Identity. This lesson lasted 3-4 sessions for me, but I can only meet with my girls for a very short amount of time. Just know that this will last more than 1 or maybe 2 sessions. The video starts out with a girl in the bathroom wearing a mask, that is broken. The film rewinds itself until this girl is sitting alone at table during lunch. The video proceeds to go through the school day in class, throughout the halls, chess club, and lunch time. As you watch the video you notice that all the students in the school wear masks. At one point in the hallway scene, you see a beauty ad that shows a model in a yellow masks with all of these girls admiring the ad with yellow masks. Another scene in the hallway shows a student walking down the hall with a lavender designed masks and walks up to a group with all maroon masks and switches her mask to maroon. Even the dialogue in the film is powerful. At the end of the film, the main character is in the bathroom, where the film started. This is where I stop the film for discussion. The end of the film shows the main character leave her mask behind and walk the school without a mask while her peers stare at her. When I stop the film for questioning I ask these questions and more depending on the group. What did the yellow masks mean? In the process of the discussion we talk about how we sometimes wear different masks to fit in around our school and what some of those masks are. At the end of our discussion, I ask students to think about what their mask would look like. The next 3 sessions my girls wanted to complete their masks. Here are their masks at the end of the first two painting sessions. Mine is the one that has designs on both sides. Would you have been able to do what she did and why? How do you think the other students felt seeing her without a mask? Was she a leader in her school? notice how her mask was very different and she took hers off, but she didn’t have any friends. I am hoping to then use the ending of this film as a springboard to discuss self esteem. Thanks, Michelle, for sharing. I did use this video today and while the girls said, "It's a little creepy" they did respond that what the director was trying to tell everyone was to be yourself. We also talked about how we all wear different masks throughout the day. . .we might have one mask on at home, one at soccer practice, one at dance, one in math class and even a different one at lunch. The expectations and rules for each may dictate which mask we wear. On the soccer team for example, we might be aggressive and loud, while that behavior wouldn't be appropriate during a lecture, at the movies, or in church. More importantly, however, is not to let the mask define us as a person and allow it to change who we really are. This was a great video and complemented the one I showed them last week (Colbie Caillat's Try) that says we "don't need to try so hard" to fit in. If you are interested in being a Lesson Leader, please let me know. I'd love to hear and help share your lesson with others. Wow Carol, this sounds like a very powerful lesson, especially if the girls have a safe space to explore their reaction to the film and the masks that they wear. I plan to share the video with my teenage daughters. what do you do prior to and after this lesson. I am trying to plan a 6 session small group counseling group on self esteem for 7th graders and this would fit right in. This activity session sound great for my girls group. Where did you purchase the mask form?